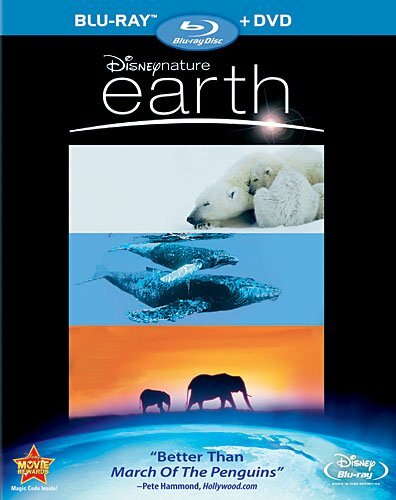 OVERVIEW: The Walt Disney Company introduces a new motion picture label, DisneyNature, to home audiences when Earth comes to Blu-ray™ Hi-Def and DVD on September 1, 2009 from Walt Disney Studios Home Entertainment. The debut home entertainment offering from thelabel, Earth tells a trio of unforgettable stories sure to captivate movie lovers of all ages. Set against some of the world’s most spectacular vistas, this breathtaking motion picture achievement uses the classic Disney storytelling tradition to celebrate the diversity and determination of its animal stars in a heroic journey that covers the Earth from pole to pole. FILM REVIEW: Breathtaking, spectacular, awesome, magnificent, inspiring, jaw dropping and eye popping! If you care at all about this place, this planet that we call home, then you should see this film. Heck, I would go as far as to say that all citizens of this planet should see this film. Some of you might be thinking that here’s another movie with the purpose of giving you a guilt trip about how we are killing this planet and how we need to change quickly. Not true. Even though yes, the movie does point out certain conditions that our planet is going through, its purpose is not to give you a guilt trip. This helps make the movie that much more enjoyable. I would say that the purpose of this wonderful motion picture is to take you to places that you’ve probably never been, see things you have never seen, and experience our planet Earth in its purest, most natural form. It wants to give the viewer a new appreciation for this place that we call home and to not take it for granted. From grass to plants and flowers to trees and incredible forests, from small, exotic birds to bears, elephants, and members of the cat family, to whales, and from the arctic to majestic mountain ranges to deserts, tropical rain forests, and the vast oceans, this movie will show you some of the most once-in-a-lifetime views of our planet that you can ever imagine or will ever see. You will get a taste of all the seasons, winter, spring, summer and fall, from so many different parts of the world and from the point of view of a wide variety of animals with whom we share this world. As you can gather from what you’ve read so far, the cinematography for this film is grandiose to say the least. It is the real essence of this movie. The proper use of music accentuates the view and in this case, does it ever. The soundtrack for this movie is just as grandiose. It properly fit each scene and each moment. Disney is really good at cinematography and music and the combination of both. This is like a super National Geographic special or Discovery Channel exclusive but with Disney style and professionalism. The icing on the cake is having James Earl Jones as the narrator . . . need I say more? The sun, water, air, and earth can bring both life and death, and in between those two is the struggle for survival. It is the circle of life and this film paints this picture for you and it’s a masterpiece. Writers/Directors Alastair Fothergill and Mark Linfield have worked these kinds of projects before such as with the TV series Planet Earth. They have brought together this work that deserves to be on the big screen. A very nice way to celebrate this Earth Day would be to go see this movie. BLU-RAY: The film is presented in 1080P widescreen in a 1.78:1 aspect ration preserving its theatrical format. The picture is just flawless, bringing to perfection the breathtaking and spectacular cinematography of the film. This is one of those films that was made for High Definition. Not only the picture looks great in this release, also the sound it is good, a 5.1 DTS-HD Master Audio (48kHz/24bit) in English, Spanish and French that provides a good complement to the picture. English 5.1 DTS-HD (Dolby Digital) Spanish and French 5.1 .